I am very pleased to announce that BibleForge now includes a Chinese translation. Actually, we now have two translations: Traditional Chinese and Simplified Chinese. These translations are from the Chinese Kings James translation project. BibleForge and the CKJV team have been working together to add their Chinese translation to BibleForge. The CKJV is actually a revision of the Chinese Union Version. The Union version was translated from the corrupt critical texts (like most modern versions), but the CKJV team has been examining the translation and bringing it into line with the preserved Textus Receptus. The Textus Receptus is what the King James translators used, hence the name Chinese King James Version. It is important to note that the CKJV is using the Textus Receptus as the standard and not simply forcing a back-translation from the KJV. It should be mentioned that this translation is still a work in progress, but it’s wonderful to finally see a translation coming into being. The Chinese language has long lacked a good translation that is understandable to more than one billion Chinese speaking people. May the Lord bless His Word. Adding Chinese to BibleForge took a lot of work (and is still not completed). Lord willing, I’ll blog about that soon. Just a quick update to let you know that I’ve been working on obtaining the grammatical information for the Old Testament Hebrew. As far as I know, no one has ever made this data freely available, so it should be of great value. It will also take a great deal of effort. It will be done in stages. I plan to complete a rough draft first and later revise it. I’ll post updates on my progress. After a lot of work, I created a script that transliterates both Greek and Hebrew. It is also able to create pronunciation forms in both the IPA and a dictionary-like style. It also can use modern pronunciation or a reconstructed Biblical pronunciation. So now when you click on a word in BibleForge, you have the option of selecting which system you’d prefer to see. You can also try it out live online. Let me know if you have any ideas to improve it. Lord willing, this is just the beginning of a lot of progress for BibleForge this year. This year has seen a lot of great progress for BibleForge. However, since much of the work was behind the scenes, the repositories look a little bear for most of the year. But I’m pleased to announce that two new significant features were just made live: lexicon lookups and a new Bible version. Now, it is easy to learn details about each word in the Bible. Simply click on a word, and a callout will popup and immediately give you a quick overview of that word. This is just the beginning, and it does not show a lot of information, but more is on the way soon. I was hoping to add other languages to BibleForge, but I was unable to get in contact with anyone working on a translation until late in the year, so Lord willing, next year will see the addition of the first non-English version. Now that a lot of the groundwork has been laid, I look forward to see what 2012 will bring. I’ll try to make some definite plans and write about them soon. It took longer than I had hoped for, but I finally finished adding the vowel points, cantillation, and other information to the Hebrew text. This commit represents about nine months of hard work. Much of this was done by hand, carefully comparing many old extant manuscripts and documents, such as the Aleppo Codex, the Leningrad Codex, and The Second Rabbinic Bible. Now that the Greek and Hebrew of the entire Bible has been throughly examined, the fun work will begin: coding new features. Lord willing, I will be able to add many new, useful features soon. So, it’s been a little quite around here, but that’s not due to lack of work. In February, I finished checking all of the accents and breathing marks in the New Testament and fixed several mistakes. For the past few months, I’ve been working on adding vowel points and accents to the Hebrew Old Testament. In the process, I’ve made hundreds of improvements to the text. I think it is safe to say that it will be the most accurate Bible text available in digital format. I hope to finish this up this summer. After that is done, I will get back to adding more features. I have a lot of ideas planned for BibleForge in this new year. Lately, I’ve been double and triple checking the Greek text that underlies the New Testament. Lord willing, I will soon implement the ability to delve into the original languages just by clicking on a word. Then I plan to add the ability to read and write commentaries. An installer is already in the works, but is not working quite yet. The ability to easily move back and forth between texts as well as searches is also high on my list of features. I also plan on adding some other translations at some point — particularly in other languages. Lord willing, this will be a great year for BibleForge. Programming is all about making decisions. Unfortunately, there is no real way to know which decisions are the best ones until you’ve already made them. For the past few weeks, I rewrote much of the internals of BibleForge to correct some earlier decisions that could have been better. The rewrite also includes support for the subscriptions at the end of Paul’s letters. These changes are now live on BibleForge.com. 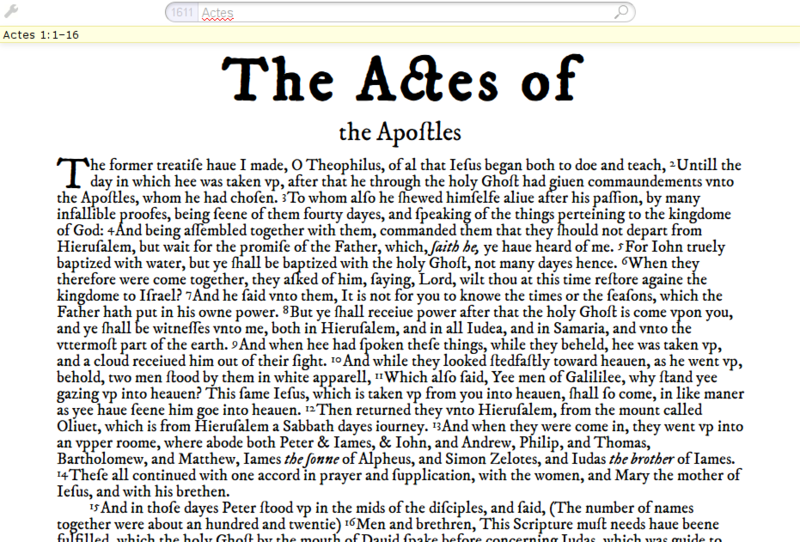 The new year should see some exciting new features added to BibleForge, which I’ll write about later. In the meantime, enjoy celebrating the birth of out Saviour, Jesus Christ. I pushed a small bug fix to the main BibleForge server. Let me know if you experience any problems. To the extent possible under law, all copyright and related or neighboring rights to this blog have been waived.